A successful event contains many underlying factors that blend masterfully together to create a final event that your guests can appreciate, and you can be proud of for years to come. However, when it comes to planning an event, it can be overwhelming with so many details to decide. Furthermore, there is an art to selecting just the right details to ensure they properly fit together to bring your final vision to life. In order to understand the importance of attention to detail when planning your event, let’s take a look at the following breakdown of the various elements of the event layout as well as the event design, beginning with the event layout. The right layout can really heighten the experience of the event. Therefore, when it comes to selecting the layout, you want to choose one that suits your occasion. There are many layouts to choose from, from traditional to cocktail to banquet and even boardroom and more. However, to select the right layout for your event, you first need to create a vision that will help guide your decisions based on your specific needs, which will enable you to make the most impact on your participants as well as increase their engagement with the activities for a worthwhile event. So, let’s get started. 1. What is Your Objective for the Gathering? Carefully consider the reason for your event. For instance, is your objective to socialise with other guests? Determine the main reason for your event as well as how it will benefit the people who attend, which in turn will help you determine the most efficient layout for the venue. 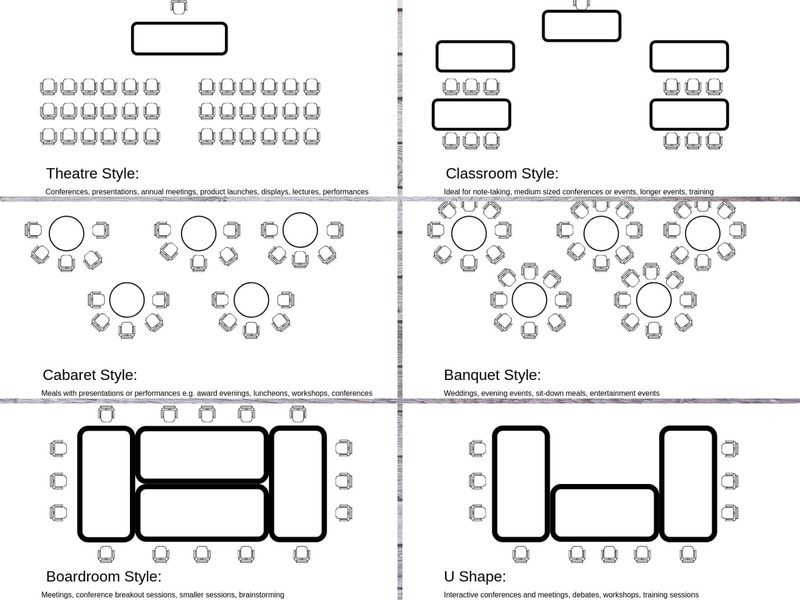 Your chosen layout should accommodate the number of participants you expect to attend your event, which helps ensure everyone has a seat. You should also ensure the layout accommodates wheelchair users. If you anticipate a large number of participants, you want to also make sure the layout isn’t too confined and that each person has a good view. If there will be a speaker at your event, you should also make sure your attendees are not seated too far away. You should also expect unregistered attendees; therefore, incorporate extra seats, which will help you quickly find additional seats if needed. The room’s measurements will also determine the event layout. The venue often provides various setups and layout plans for different spaces, which can help with your layout and setup. If you are short on space but anticipate a large number of participants, you can always divide your event into two days or offer two sessions to accommodate the large gathering. If the event is successful, you may even consider hosting a second event in the future for guests who were unable to attend due to the large turn out. 4. Will There be a Stage? Stages usually require lots of space; therefore, you need to take this into consideration when selecting your space, especially if you plan to have tables, chairs, and other furniture for a group discussion as this will increase the space needed for the stage. However, it is also possible to simply have the speaker stand on a low podium or remain at attendee level to help save space. 5. Will There be Planned Activities? If there will be scheduled activities at your event, then you need to determine the space available to plan your activity. You should also be sure the layout is suitable for your speakers prior to their appearance as rearranging a room takes a lot of work and time, which can take time away from your event. If you are going to make changes to the room, then be sure to have extra space for storing items as well as staff available to ensure the room change goes smoothly. Emergencies can occur during your event; therefore, you need to strictly follow health and safety guidance when planning the layout of your room to help ensure the occupants are safe. This includes planning exit routes and making sure the event can be quickly evacuated during an emergency by ensuring your event furniture and equipment doesn’t obstruct exits, walkways, emergency assembly points, refuge points, and muster points. You should also ensure your event does not exceed the capacity limit, which may be reduced for older buildings and high rise buildings, so be sure to ask. The design elements of your event can transform your space into an inspiring place that people want to take part in, no matter the purpose of the event. The space that you choose to host your event sets the stage for all else to follow. Therefore, thoroughly examine the space for its dimensions and features, which will help you incorporate a proper design. and the locations of the bathrooms, kitchen, and the bar etc. You should also observe the location of any screens, projectors, and other in-room devices, which can also affect your design. You should view the space as a canvas with nothing on it, which will help you plan the layout. Think about the best way to divide the room into the perfect balance of furniture and space. In other words, there should be an equal balance of furniture and open space to allow easy mobility and to avoid an overcrowded room. It is also important to plan a route that makes it easy for the participants to roam freely throughout the space, which helps encourage interaction. The room’s furnishings, as well as the building design itself, create lines that can be used to bring an overall harmony to your space. To appeal to the senses, your design should incorporate these lines, which include vertical lines, horizontal lines, and dynamic lines, but in the right fusion. For instance, columns, wall hangings, and curtains all have vertical features, which can be used to create vertical lines in your design. However, to incorporate horizontal lines into your design, simply add rectangular items, such as tables and rugs. You can also use rectangular floor tiles to create horizontal lines. Lastly, angles and curves, also referred to as dynamic lines, add movement and intrigue to a room, so don’t forget to incorporate these lines as well. Before decorating your space, take a good look at the room and observe the natural lines and then strive to fit them with the different design elements that you bring in. Incorporate vertical lines to lengthen smaller spaces, while horizontal lines can be used to draw high ceilings closer. The shapes created by the silhouette of various objects, such as structures, furnishings, and furniture, create forms, which can be used to add drama to a space. In fact, you can create various looks by using forms. For instance, to create an especially eye-catching look, simply incorporate one main shape for your event, such as squares or rectangles, to influence your design. You can also bring in statement pieces to help create form. The scale or proportion of the form can also be used to help capture the eye, such as incorporating oblong tables. Because it is an unexpected form, it makes a big impact that captures the attention, which also makes it an immediate focal point. You should also take a look at the room and observe the ambience. For instance, a dark atmosphere, though great for networking, may not be so great for speaker presentations and performances, which require more lighting. The mood of a room is strongly determined by the lighting. Lights can even be used to enhance the lines and space of a room as well as highlight or emphasise different areas in the room. For instance, a spotlight can be used to bring focus to a stage. You can even use LED furniture to combine form and light. Experiment with different lights, including pin lights, up-lighters, LED strip lights, and more, to determine the best lighting for your event. Good natural lighting can also be used to set the ambience for your event, so observe the position of the windows as well as how they cast light in the room, to determine how it will impact the space. Colours, like lighting, help set the mood for the room. Therefore, choose colours that support the mood you want to inspire in your guests. For instance, gold and other metallic colours, as well as black, work well for staging a lavish celebration, while cool tones, such as blues and greens, help inspire learning. Once you determine the colours you want to use, simply incorporate them into the printed materials, decorations, lighting, and other main elements. When incorporating the colour scheme, everything doesn’t have to be the same colour either. For instance, you can also use different variations of the main colour to add interest while also creating a cohesive look. Patterns also add interest to your design. In fact, fusing block colours with patterns actually enhance each other. Therefore, think about how you could incorporate various patterns, such as animal prints, stripes, and floral’s, etc., into your design to help create focal points in the room. However, if you choose more than one pattern, be sure they balance each other. For instance, a busy pattern should be paired with a bold pattern to create harmony. You can also incorporate core colours in patterns to help create a harmonious look. Texture is also important because it strongly influences how attendees will interact with your event physically. Humans are sensory by nature, so incorporating a sense of touch into your design will help pique their interest. For instance, a stunning ice centrepiece will naturally make people want to touch it. Hence, when selecting textured decorations for your event, think about how the material looks and feels. If possible, incorporate both synthetic and natural materials. In addition to choosing a texture that can be both seen and felt, you should also be sure to incorporate visual texture, such as 3D wallpaper. In this instance, though the texture is only seen, the mind perceives it as real, so it also stimulates the senses. When done correctly, the right event layout and design can create a great looking event that stimulates the senses and grabs your guests’ attention from the time they enter, which helps create a memorable event. 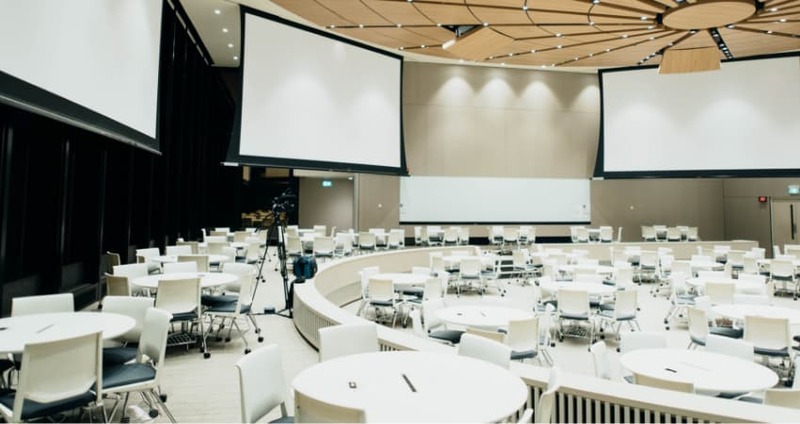 When it comes to selecting an event layout, you may be tempted to choose the traditional room layout, which is the simplest and offers the most cost savings, however, it may not be the most attention-grabbing, which can bore your attendees. Instead, consider choosing one of the more elaborate event layouts, which are a bit more unexpected and will quickly capture your guests’ attention and make it all worthwhile. Lastly, when it comes to the furniture, consult with your venue to see if they have different furniture options available that are included with your venue, or do you need to rent the various options, such as chairs, tables, sofas, and linen hire etc. because you need to calculate this into your cost. Therefore, it is worth checking specifically what furniture options are included with the venue as well as the various different types of furniture options available to you, so you can plan your costs accordingly.